In north-west Saxony are the lowland plains of the Leipzig District. This region also has relatively short borders with Saxony-Anhalt to the north-west and Thuringia to the south-west. It has three main rivers crossing its territory; the Mulde, the Weiße Elster and the Pleiße, and there are large areas of lakes to the west. The area is probably most famous for its great castle in the town of the same name: Colditz. This large white establishment has been used as a workhouse and health institute — but most famously as the place where Allied Officers were imprisoned during WWII. It was alleged at the time that there was no escape from Colditz. 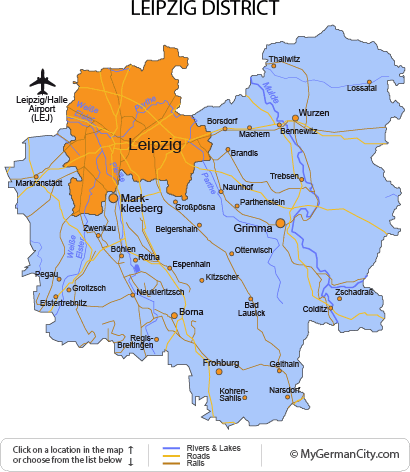 Other towns in the Leipzig District are filled with historic buildings, small woods and agricultural areas, and are generally very relaxing. Follow one of the many walking trails across the area to discover a little bit of everything.